Composer Will Ogdon, founding chair of UC San Diego’s department of music, died Oct. 6. He was 92. Ogdon was hired in 1965 by Muir College Provost John Stewart, along with composer Robert Erickson, to create the music department at UC San Diego. In turn, Ogdon hired conductor Tom Nee, and classes began in 1967. Under Ogdon’s direction, UC San Diego’s department of music provided an atmosphere where students were encouraged to explore their own original ideas, without a rigid emphasis on classical and earlier 20th century music. As the department grew, newer faculty such as Ed Harkins, János Négyesy, Pauline Oliveros, Bernard Rands and Roger Reynolds sustained Ogdon’s vision, and the department earned an international reputation as a university center for experimental music. Négyesy, a violinist, joined the faculty in 1979. He premiered and recorded many of Ogdon’s compositions and said that Ogdon’s music stood out for being gentler and more directly appealing than the sharp, jarring sounds of Schoenberg and other modernist composers. Ogdon himself appreciated the music of modernist composers of the Second Viennese School. 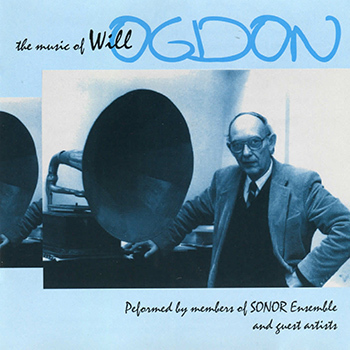 Will Ogdon was born on April 19, 1921 in Redlands, California. He earned a doctorate in music theory at Indiana University and studied composition with Austrian composer Ernst Krenek. He considered his work with French composer and conductor Rene Leibowitz during a Fulbright fellowship in Paris from 1952 to 1953 as formative. Ogdon also held faculty positions at the University of Texas at Austin, the St. Catherine University in Minnesota and Illinois Wesleyan University. At UC San Diego, he taught composition, music theory and music literature. Although he was a prolific composer, his music was not widely known due to Ogdon’s modesty and reluctance to promote himself. The only CDs devoted to his music (“The Music of Will Ogdon,” 1997; and “Will Ogdon: Compositions 1995-1999”) were recorded at UC San Diego. His music was performed by the department’s SONOR experimental music ensemble as well as by ensembles in Los Angeles and New York. His essays on composing and teaching music were published in various journals. His students continue to distinguish themselves in educational and compositional careers. Following his retirement in 1991, Ogdon continued to compose. He wrote his last piece in 2008, and it was premiered at UC San Diego by Négyesy and violinist Päivikki Nykter. Ogdon is survived by his wife, Beverly; daughters Bethany and Erica; and son, Benjamin. The family will hold a private memorial. UC San Diego’s department of music will host a tribute concert during the winter in the Conrad Prebys Music Center. More information is available at the UC San Diego Department of Music website.